This is part 2 out of 6 for Dalek Empire III aka The One With David Tennant in it. "The Border Worlds are gripped by a terrible plague... Galanar's mission takes him right to the heart of the tragedy. The Dalek plans for 'Geo-forming' are already in operation." What did you think? Is geo-forming like geo-caching? Was that ever really that big of a thing? How were those pesky Daleks? This felt like more exposition on top of the first episode. The wardens have figured out that the Daleks aren't afraid to kill. You would think that the history of them would have been passed down a little better, most these people have no idea what they are. Alas! We get more of David Tennant! And that's exciting. It's still not really clear what the Daleks' plan is though. They have the cure for the plague that they're seemingly administering. My guess is that there's some other element to this 'cure' that's going to make these victims robo-men or something like that. Also can't figure what geo-forming the planets has to do with any of this, but I guess we'll find out! 15 minutes into this and Siy's voice is the most annoying thing I've ever heard. I'm not sure if this story is so much exposition but just a much smaller story on reduced scale than the previous series. I'm kind of enjoying how few people know about the Daleks. I'm liking the characters and curious as to whats going to happen with Tennant's character. I'm also curious about the Dalek's plan and their geoforming. We saw what they did to Jupiter. This continues to be a Firefly story with all of the boarder planets and the sketchy federation. I know those words are also used in Star Wars, but this feels like less of a space opera and more like people just trying to get by. Yet this was obviously the best thing ever because David Tennant's character went undercover as a doctor and was frequently called that. More intriguing stuff happening, the Daleks are getting ruthless and more people are moving around to something intriguing. I'm thinking this six-parter is allowing more freedom for character stuff, which is much better than everyone keeping secrets. Doctor! wait, not that one., but almost. so this plague is ravishing the outer planets and the inner government is being all gay (Firefly anyone?) and not letting people in/out, except for this Doctor played by David Tennant but he's not really a doctor and some superhuman or something (testing for future roles?). The Daleks are really nice and are healing people or something, taking them to huge planet-scale hospitals or something. meanwhile this guy Sye Tarkoff or whatever wakes up from hibernation after like 20 years. he went to Valisha (Kahl's homeplanet) where Kahl left a psychic image of the Daleks in his tomb to warn all others in the future. so Sye has to go the the central government, or is it some other inner government (wait.. is there two?) and he has to convince them to take arms against the sea of troubles that is the Daleks but TOO LATE! 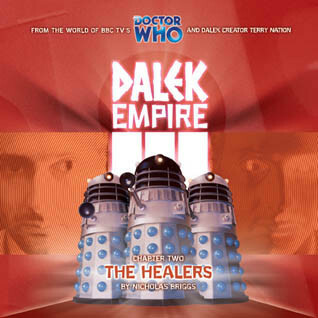 the Daleks are already everyone's friends healing this terrible plague.